hen you think about underwater exploration, your mind probably conjures up images of shipwrecks. We know ours did. Perhaps you think of searching for buried treasure or ill-fated expeditions seeking the lost city of Atlantis. These things are the stuff of legend and have been restricted to fantasies. Today’s technology helps with this fantasy we once had. Underwater Drones most of all are useful. Surely you may never have assumed you’d ever get a chance to use something like this, accomplishing a dream. Well, buddy, it looks like you were wrong. It shouldn’t really be too weird for us nowadays to have something that previously only existed in fiction and finding out it’s a reality. With the incredible advancements of technology over the past number of years, it’s no surprise to see mindboggling technology changes. We see cool and awesome products developed for commercial use that completely change the way we live. The underwater drone is no different. These robots run just like your average flying drone. They have propellers and cameras, only they swim instead of glide. They explore the deep unknown beneath the waves as opposed to causing general UFO panic around communities. There’s really no negatives here. They’re used by marine biologists, underwater photographers, and rescue crews to find things that before were feared to be lost to the depths forever. Today they’ve been developed for average people. Though we must warn you, they can be pricey. In this article, we’re going to bring you the 9 best underwater drones for you to check out. With one, you can explore the deep as you always wanted. Don’t be scared of what lies beneath, let’s dive in and see what the future of the great open ocean is going to look like. What are the main things to consider when buying an underwater drone? We see you’ve decided to buy an underwater drone. That’s great! You’re going to have a heck of a lot of fun exploring the ocean floor, swimming through streams, and searching for the Loch Ness Monster. Before you’re devoured by an apparently not-so-mythical creature in the Scottish Highlands, you need to know some things. These are amazing advancements in technology, but with that comes features. This is a good thing but also a bad one. As each great feature costs more, with the very best being the most costly of them all. Obviously, before buying, you want to know what you’re paying for. This is to make sure you get the best kind of underwater drone for you. We have you covered. Like regular flying drones, different underwater drones have a variety of distance ranges. This will affect how comprehensive your footage will be. This important for the documentary-type of person to consider.The distance range will depend on what you want to use the underwater drone for. If you’re planning on casual use, then a drone with a vast range will unlikely be needed. If not, you’ll want to avoid diving deep enough to lose connectivity. The range affects that very thing. If you’re planning on professional usage, then having a wide range of connectivity is a must. You’ll no doubt need to search far and long for several hours and for a long distance. The range and connectivity will need to be much larger. Without it, you’ll struggle to achieve the best results from your underwater drone. You then might end up wishing you’d splashed out that little bit more money in getting the most appropriate product for your needs. High definition all the way! If you want to see everything underwater has to offer you need the best quality video possible. Luckily, even the cheapest drones will come with at least ultra HD, and some will have 4K. This means you can be sure that you’ll capture incredible, high-quality images. They will wow your buds, your family, and anybody else, as well as provide excellent educational shots from freshwater lakes to salty oceans. The difference between Ultra HD and 4K is not exactly massive. Though 4K is better and captures more pixels at the best rate possible for an overall better look. Yet Ultra HD is a set above LED, which is beautiful in 720 and 1080p. This is more of a personal preference. We’ll be honest, if the price between the two is small then splurge a bit for the 4K. If we’re talking hundreds of dollars, Ultra HD is perfectly fine. It is better than many cameras anyway. The longer the tether, the further you can explore throughout the ocean, lakes, and rivers. Underwater drones come with a standard tether length of 25 meters, although some are available with a length of 50 meters too. It’s even possible to upgrade to longer tethers so you can really explore the great unknown deep. You don’t want to lose your drone, so a tether is an absolute must, especially if you forget to charge it and lose connectivity. We all know how unpredictable ocean currents can be. These tethers will also assist in keeping the drone safe in murkier waters. While you might not get the clear action shots you desire in darker waters, you might still enjoy testing out your drone in them. Of course, it might be needed for work assignments too. Keeping track of your drone with the tether means you never have to feel the sting of losing something that costs so much money. However, we’ll get to pricing in a little while. High-quality pictures and videos mean you’ll need a high amount of storage space. Many of these underwater drones will come with a built-in memory space of 64GB or more. This feature saves you money on micro SD cards. It’ll ensure that you have guaranteed internal memory space to make sure you manage to save every shot you can. When you are running out of memory space, you can easily transfer the footage onto your computer. This frees up space to film new and exciting parts of the deep that have never been seen before. Some drones will also give you the option of increasing the storage space using SD cards. This further enhances your filming capabilities and allowing you to capture as many shots, scenes, and videos as possible. An ordinary flying drone will give you around 30 minutes of battery life before you need to land it and charge it for another day. Alternatively, underwater drones will give you a variety of battery lives that range from one hour to as long as seven! Again, the battery life you need will depend on what you want to use the drone for. Excellent battery life might mean that you miss out on other features, and vice versa. Of course, a product with great battery life will be much more attractive than one that might only give you an hour of usage at most. 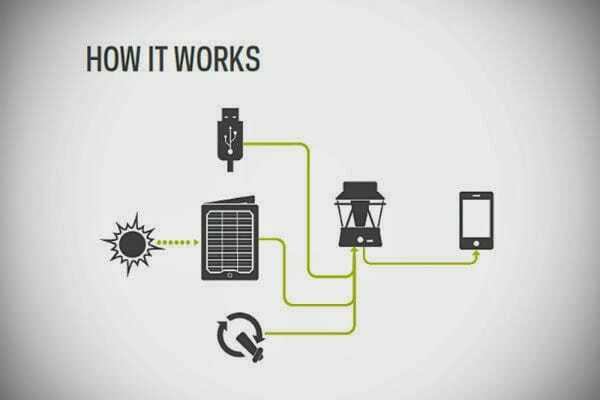 This will save you time in recharging, as well as spending extra money on additional battery packs. It will also give you better peace of mind that you will be able to get every single shot you need. This comes without feeling like you need to rush. It’s perhaps the most important factor, as you can enjoy yourself, instead of feeling like you’re working against a deadline. As exciting as underwater drones are – so exciting that you can’t wait to get your hands on them and explore 20,000 leagues under the sea. You might have to wait for your favorite to hit the market. The majority of underwater drones are ready to be snapped up and unleashed into the water. Others won’t be shipped until next month at the earliest. If you’re planning on getting one as a present for the holidays, this won’t be too much of a problem. It’ll be under your tree by the new year. If you can’t wait that long, then it might be best to select an underwater drone that will be at your door by the end of the week at the latest. Drones aren’t cheap, especially underwater drones. Their prices range from around $1,000 for lower-end products to costs as high as $6,000 for the truly awesome, top of the line versions. Obviously, the more expensive products will provide the best quality. However, these drones are more geared towards professional photographers and people who frequently work underwater. With the amount of use the drone is going to get, it will more than pay for itself. If you’re simply a hobbyist or casual drone owner, then it might be wise to start off using one of the cheaper products. This will help give you a decent idea of how to use them, and how often you’ll use them. This will also answer whether or not you’ll even enjoy it! There’s no point splashing that much cash on a product that you’ll hardly use. Checking out reviews for each and every drone is the best way of figuring out which one is the best product for you. Reviews are a great way of getting the full picture from people who have used the product themselves. Instead of relying on the company telling you how awesome the product is you’ll learn things that you otherwise wouldn’t know. Companies only hype up their products, so you need an honest answer to your questions on a product. It might be that you are buying your drone for a similar reason that someone else already has. Their existing experience will allow you to understand the pros and cons of the product so you can make an informed decision. These people writing the reviews, either professionally or not, have more expertise than anybody else. That said, it isn’t too crazy to trust their word. We know that you might not want to trust every review you read, especially ones that are filled with contradictory information. However, these reviews are a necessary evil in understanding whether or not one drone is better than another. It could be the difference between spending thousands of dollars. Without them, it’d be almost impossible to figure out what it the right product to buy. With this, we’d find ourselves trying and testing everything under the sun and spending a fortune in return packages. Of course, there’s bound to be some kind of red tape that you have to deal with. You are likely using the drone on public property after all. Drones have encountered restrictions due to issues with privacy, airspace, and the potential for accidents. That said, underwater drones are sure to face similar problems. However, it’s not yet clear what these restrictions will be. Underwater drones are most commonly used in professional situations such as by marine biologists or fisherman. They’re not yet the commercial behemoth that flying drones are. Because of this, it’s best to be cautious and do your best to stay within the law. If you want to film in lakes, streams, and oceans, then it might be wise to check with the local government. This will help to discern what is expected of you and whether or not you’re even allowed to use them. If you’re using your underwater drone for traveling, then you might find it a little easier. Places overseas are more lax about their laws than in the United States. This will give you the chance to get some of the most amazing and unique shots before the area becomes flooded with other underwater drones. As with any kind of overseas country, though, we need to remind you to treat the area with respect. We must still adhere to their laws. Just because you’re a tourist doesn’t mean you’re above them. What are the main uses for underwater drones? Like anything on this Earth, there are a lot of purposes for something. While forks, for example, might be for eating….that doesn’t mean that is their only function. They’re a handy weapon or digging tool if something weird goes down. Underwater drones have the same type of vibe. While they might be used for the exploration part we referred to above, there’s so much more to them. Let’s go over some things people do with them today. What are they used for? A lot of people will buy an underwater drone to record all of the cool stuff that they can find in oceans, bays, rivers, and lakes. Typically, they’ll take them on vacation, along during their travels. You could find somewhere close to home that you can discover new things at time after time. They’re an awesome way of getting crystal clear shots of different parts of the world that some wouldn’t be able to see. Like underwater cameras and GoPros before them, they can act as sweet little devices to record all of the fun that is possible under the ocean. Over the coming years, you’ll no doubt see videos of amazing coral reefs, close-ups with turtles and octopuses. You may very well capture yourself swimming alongside fish of every color imaginable. Instead of relying on your snorkeling and scuba diving memories, you’ll have shots and scenes that will stay with you forever. It’s not all fun and games, though. Underwater drones are also used in professional environments. They’ve proved popular for professional photographers and cameramen who’ve used them to capture previously challenging shots. These underwater drones are responsible for showing us things that we’ve never seen. As well as being used for entertainment, they’re also useful for mapping and exploring parts of the ocean. They help to discover things in places that were never found, and that is crucial for great documentaries. As well as studies by marine biologists, who use the drones to spy on newer or lesser known creatures and/or undersea plant life. They can also be used by police and the military for finding lost objects and even searching for missing people. Drones can be used well due to being smaller than divers. This allows them to see in tighter spaces. To top it off, they’re controllable remotely from out of the water. These underwater drones are also capable of greater depths than people can go easily. If nothing else interests you, their streamlined designs are cool too. They also offer simple propulsion, which means they can stay underwater for longer than your average diver ever could in one session. It’s not enough anymore to simply show pictures of animals, plants, and seascapes when trying to educate kids at school. With all of the resources currently available for education, there’s no need to rely on the methods of the past anyway. With things such as virtual and augmented reality, the opportunity to use existing video and transport the kids digitally right into the ocean is immense. Some underwater drones even have live-streaming, meaning you can demonstrate parts of the ocean all over the world in real-time. This is massive for teaching kids about types of fish, coral reefs, and what the bottom of the ocean is like. You might have grown up checking out series such as David Attenborough’s Blue Planet and being wowed by that. Today we see shows like Frozen Planet on Discovery Channel and BBC’s Planet Earth & Planet Earth II series. All used versions of drones when they went underwater, especially Planet Earth II. They were capable of getting shots in Ultra HD that were never seen before. Kids of today are lucky to learn in a world full of drones. They can watch sharks hunt their prey. On top of this, they can view turtles migrating to other parts of the ocean, and witness dolphins playing around in the most remote parts of the planet. It’s also an excellent chance to inspire conservation efforts. With pollution and climate change affecting our oceans, it’s a great way to discover what can be done to halt and reverse these problems before it’s too late. Do you love the calm tranquility of sitting on a lake, waiting for the line to tug and reeling in a fish of mammoth proportions? Then an underwater drone will bring that activity into the 21st century. Long gone will be the hours of sitting, waiting, sighing, and waiting some more. Instead, you’ll be hauling in fish after fish after fish, for either your dinner or releasing them back into the water afterward. Fishing purists might scoff, believing you’re completely defeating the purpose of fishing by giving yourself the means to view under the water. However, anyone who’s ever fished before knows how frustrating it can be if you’re unsuccessful, and even a little frustrating when you are. The underwater drone will remove all of this frustration. While it might feel like cheating, it’s expected as technology becomes even more advanced. Imagine, if underwater drones had existed in Hemingway’s time, The Old Man and the Sea would never have been written. Did you know that we know more about space than we do about the deepest, darkest depths of the ocean? Crazy, hey? Underwater drones can help bridge that knowledge gap and finally introduce you to all the weird wonderfulness that lurks in the shadows of the deep. Do you want to see giant squid battling super crabs? An underwater drone can make that a reality. Are you nervous swimming in water where you can’t even see your own feet? An underwater drone will eradicate those fears and you’ll gurgling underwater shanties with schools of fish as soon as you possibly can! The future of ocean exploration has never been more accessible. Instead of waiting ten years until the next Blue Planet series, you can get out there yourself and be your very own David Attenborough. Wowing your less adventurous buddies and chronicling all the crazy, scaly, and kinda scary creatures that swim under the surface. How deep can underwater drones typically go? These underwater drones would be no use if they couldn’t go much further than your every day scuba diver, would they? Much like their air-bound cousin, underwater drones give the average person the chance to dive deep down into the ocean. While here, they are able to check out all kinds of sea creatures that we’d never see otherwise. 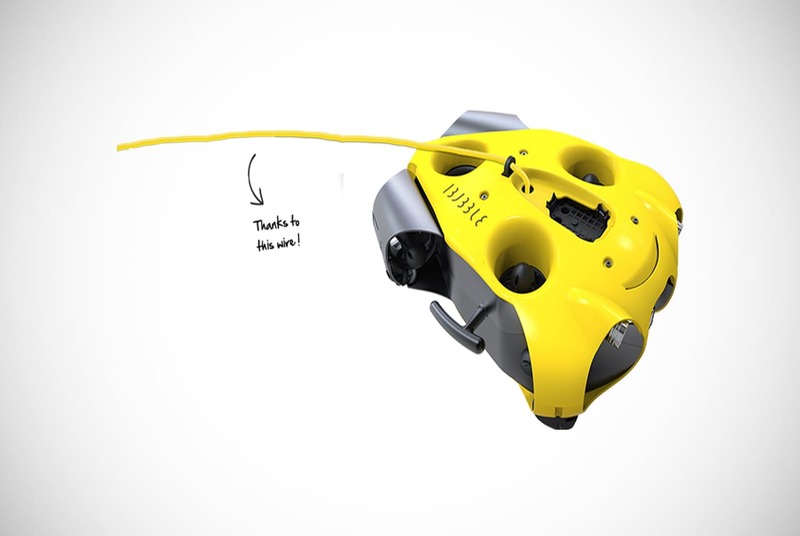 The deepest diving underwater drone can reach depths of 150 meters. However, you’ll typically you’ll find drones with around a 50-meter depth. If you’ve ever taken part in a diving course, you’ll understand just how deep 50 meters can be. It makes 150 meters much more impressive. These depths will give you the chance to check out everything you want and more. They’ll allow you to see things you would never have dreamed of seeing just a couple of years ago. All without paying for diving training. Of course, due to water pressure, it’s not yet possible to dive even further. That’s unless you’re James Cameron and can get a submarine camera going. However, it’s not out of the realm of possibility to believe that we’ll be seeing a super deep diving underwater drone sooner rather than later. All the mysteries of the deep won’t remain too mysterious for much longer. Fun fact, we know less about the ocean than we do about our solar system. Underwater drones will eliminate that issue. What is the average max depth of an underwater drone? The average maximum depth of underwater drones is somewhere between 30 and 100 meters. You’re guaranteed a minimum depth of 30 meters, and some products will even go even further down. If you want to explore the darkest depths of the ocean then you’ll need one that offers more than 100 meters of depth. However, if you just want to have a bit of fun then choosing one that goes as deep as 30 meters will suffice. These drones also come with tether ropes to keep them safe if you need to. The lines will be as long as the maximum depth so you don’t need to worry about losing them. You’ll also get many sweet videos of weird fish as you possibly can. You also need to remember that the further down you go, the less visibility there’ll be. If your drone doesn’t come with a flashlight attached (like a robotic angler fish) then there’s no point in getting a deep diving drone. Simply, you won’t be able to see anything. We guess you could attach a makeshift headlight to the drone yourself, but that would probably cause more hassle than it’s worth. If you’re not going to get the best results you want from a deep diving drone, then it’s best to consider one that goes as deep as you have visibility. How easy it is to use an underwater drone? Underwater drones might actually be even simpler to use than the flying ones that you see at every tourist attraction across the country. This is because instead of air you’re pushing against water. This provides a more stable thrust and you don’t need to worry about the occasional breeze pushing you off course. They work like anyone swimming through the water, using the force of movement to propel through the water and move accordingly. Although you’ll still need to battle against currents in some waters, it’ll be a more enjoyable and comfortable experience when compared to flying drones. The only problem that you might encounter is obstacles underwater such as fish, rocks, as well as other people if you’re filming in a populated area. Due to the connected camera function, you’ll see any obstacles before colliding and alter your course accordingly. This brings us to our next point. In some drones, you can actually plan out a “swim path,” and let the drone travel through the water and film for you. Some drones even come with sensors that can identify when there are obstacles in the way. They can either stop or change their route, avoiding crashes and allowing filming to continue. Unlike their flying counterparts, underwater drones don’t use very much power. They’re not in flight, so they don’t need to constantly use their propellers. This means they can be used for longer without worrying about the batteries running down. Due to the flowing of the water, you can even rely on it to control the drone for you. This saves power by requiring only a small amount of propulsion to move through the water. This alone makes underwater drones extremely easy to use, following a brief learning curve. Then you’re on your way without issues stopping you. What are the main safety considerations when using an underwater drone? It comes as no surprise that there are a number of safety precautions one must take when operating an underwater drone. The regular drones are up in the air and are usually going to be subject to either a set of laws the state has or the federal government uses in the United States. That includes Provinces vs Federal in Canada, as well as several laws in The UK, Australia, Mexico, you name it. These are important to know about. Drones have cameras on them, so one can see why the ones that fly are going to be subject to laws. The neighbor’s wife might be nice to see, but she has rights, ya know! This is the same sort of thing to think about underwater too. Drones affect more than just themselves. These are the things to keep in mind and the safety precautions to look out for. The first thing you should think about when using an underwater drone is how your activities will affect the wildlife. It’s all well and good exploring into the deep. However, you don’t want to do so at the expense of what’s already living there. How would you like it if some strange looking freak with different skin, weird eyes, and no arms charged into your home with a camera and started filming away? Yeah, we thought so. Like anywhere in the world, from the driest deserts to the dampest rainforest, you should leave everywhere exactly how you found it. Take nothing as you’re not Indiana Jones, dang it.. Remember to leave only footprints. This rule should be followed for underwater too. If you’re swimming in waters with potentially dangerous fish and other animals, then you’ll need to be careful. Most of the time, you can rely on them to leave you alone. As long as you leave them alone, you should be good. We’d hate for a Grizzly Man kind of situation under the water. Don’t leave plastic or anything else littered in the water. Unless you’re a scientist, a certified one, don’t pick pieces of coral from reefs. Definitely don’t punch a fish, no matter how annoying it’s being. Though if you meet one of those Krill from Happy Feet 2, you have our permission to punch them. No one should be that enlightened! In addition to the wildlife, you need to consider potential dangers regarding currents and locations. A riptide or strong current is not something to take lightly. As cool as these images you’ll get will be, it shouldn’t be at the cost of your safety and potentially life. Let’s not become a statistic, dude. Certain waters around the world pose a massive amount of danger. If you’re swimming in them, you need to be aware of what to look out for. In addition to making sure you protect the surrounding wildlife and the environment, you also need to take care of yourself too. Just because you have a fancy futuristic camera with you doesn’t mean you’re invincible. As with regular diving, you still need to remember all the important factors that keep you safe when underwater. Ensure that you don’t get too distracted with all the wonders that surround you. Be sure to keep an eye on your available air supply. It’s also advised that you continue to dive with a buddy as an extra safety precaution. This is in case dive panic sets in or another similarly disastrous problem occurs. You’re working with delicate and expensive electronic devices here. You want to make sure that you don’t lose them due to carelessness. 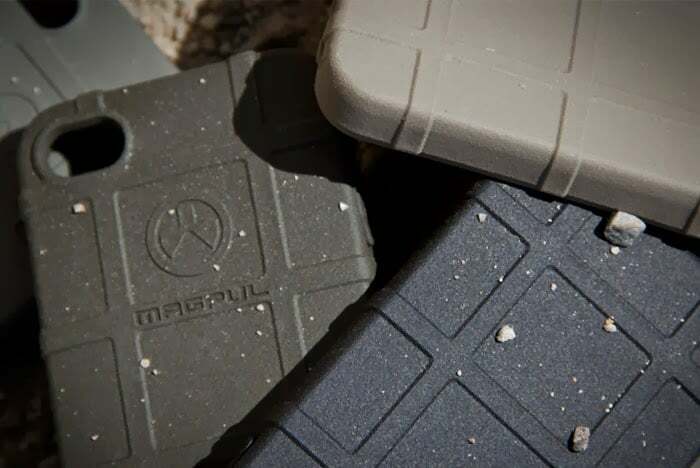 It might feel like you’re working with indestructible technology, but they’re sturdier than you may expect them to be. However, you’ll still need to be careful you don’t knock the drone against rocks or get it tangled in reeds and weeds. The integrated camera and wide-angle lens on the drone give you a clear view of what’s in front of you. When directing it through the water, this ensures it doesn’t get damaged by wildlife or scenery. You also don’t want to lose the drone, so it’s vital that you attach and use the provided tether to it when controlling it remotely. This’ll give you the peace of mind that it won’t disappear into the blue, and also make it much easier to retrieve when you need to. If you want to, you can keep the tether close or let it run as far as possible. Whatever you choose you can trust the tether. This usually made from a tough and durable material, to keep the drone safe until the end of the session. All this without coming detached and resigning your drone to floating through the water never to be seen again. The GENIENNO’s Tether Titan underwater drones are awesome. It has a diving depth of up to 150 meters, making it one of the deepest divers on our list. Due to some being unavailable to the general public, it’s hard to find the best. That is why the Tether Titan is so unique and special. As it’s available to us. While he’s small, he’s also super tough. It’s designed with durable anti-compression materials that allow it to hold up even when the sun is nothing but a distant memory. That’s not all, as this drone was specially created for professionals. Yet it’s also user-friendly enough for your average user to get hours of enjoyment from it. Using innovative technology, its 4K camera can capture images of ocean life. 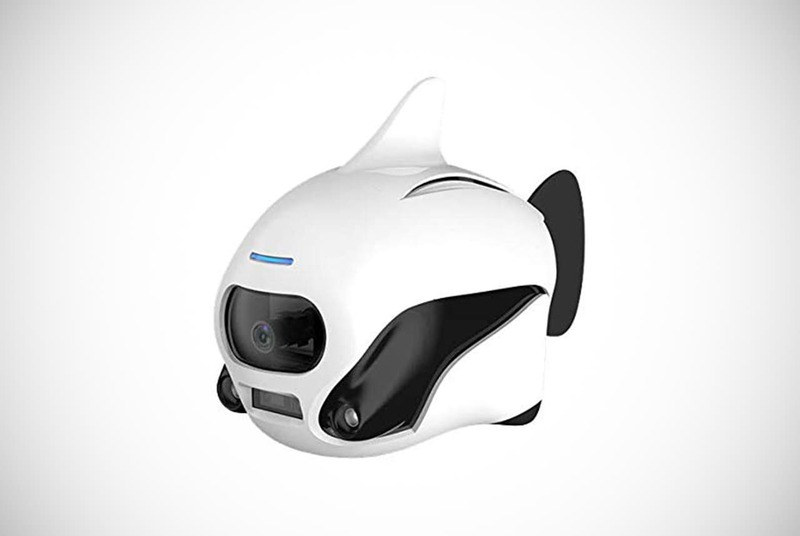 It comes with a 160-degree wide angle lens that ensures you’ll be able to capture every weird little fish happily swimming along. Perhaps its best feature is the Hydrophone 5000 (it’s actually the Hydrophone HC6121, but that doesn’t sound half as cool). This can record the sounds of the ocean and will either inspire your love for the deep or make you realize you never want to wade into it again. Whatever the result, you’re sure to get some super cool sounds that you’ve never before been able to experience. This is something that many people never thought possible. For professional or casual use, there are hundreds of great features that make the Tether Titan stand out as a future King of the Ocean. This simple use means that it comes at a cheaper price than other drones. This is an even more attractive prospect for those who aren’t yet sure if they like drones. Spoiler alert: you do. Despite its smaller size and weight when compared to other underwater drones, it comes packed with a surprising amount of power. It can explore for as much as 30 minutes with a sealed 11000hAm battery and it’s capable of reaching as deep as 40 meters. This gives you an extra 10 meters of proper range, which isn’t even possible with more expensive products. Sublue has also paid attention to safety concerns. They have included a protective netting around the propellers to prevent any curious fingers from getting injured. This also helps protect the drone from any debris you might come across in the water. It doesn’t come with a built-in camera or memory. However, you can attach most sports cameras such as GoPro to the base. This without worrying about adding too much weight to the drone itself. For those new to the drone game, this is an amazing underwater drone for starters or beginners to the drone game. We’re all looking for an underwater drone that can do everything we need it to and more. 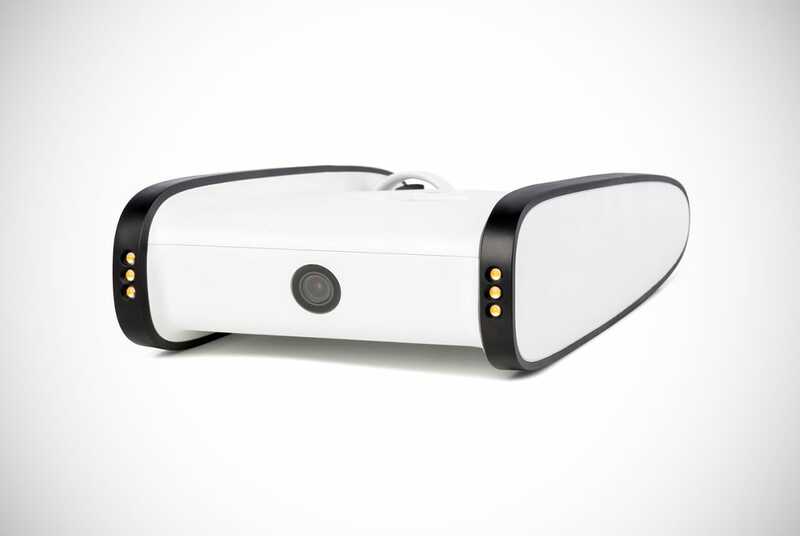 That’s why we love the GLADIUS underwater drone from Chasing Innovation. Despite being designed to look like a prop from Baywatch (intentional or not, we’re still unsure), it is packed with a ton of super useful and innovative features. These features make it one of if not the best underwater drones on the market today. Developed to maintain neutral buoyancy, you can ensure that it stays safe and secure when wading in the water. Meanwhile, it’s stable navigation makes it incredibly easy to use in all kinds of water conditions. 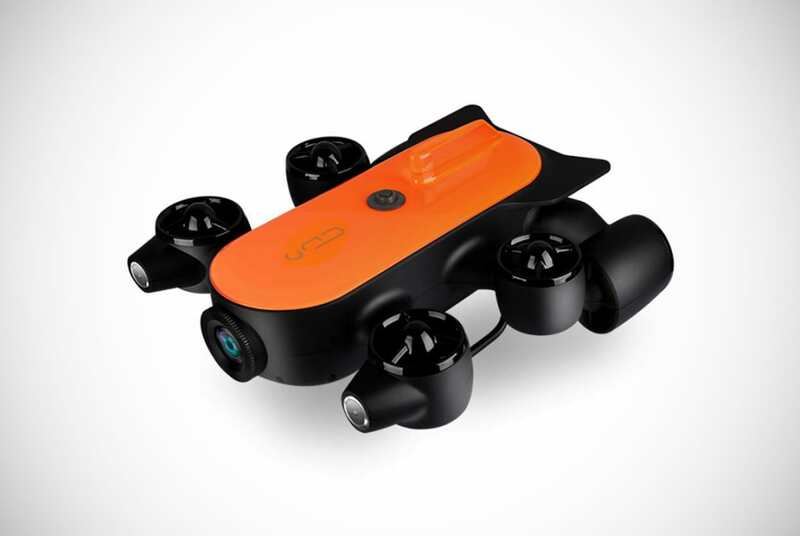 As a deep-diving drone, you can reach depths of 100 meters to capture all the bizarreness of the deep. You can navigate through rocks, reefs, reeds, and schools of fish that will peer curiously at your camera. They will surely bleed those 15 minutes of fame. This makes it a great tool for fishing, exploration, and general fun. It’s enhanced by the 4K camera that ensures every image is crystal clear. Its attached tether means you can keep it secure and within distance. However, this also doesn’t allow you to achieve as wide a range of motion as possible. Of course, keeping the drone close might be your main priority. Already available for purchase, this is the kind of drone that can ensure excellent results in all kinds of underwater environments. It provides incredible recordings of things you never thought you’d see. 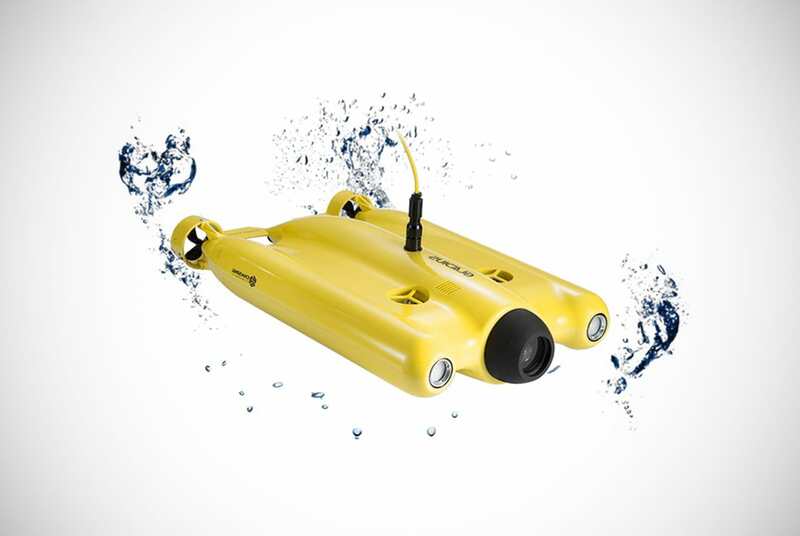 GENEINNO’s Poseidon Underwater Drone has been designed to explore as much of the underwater world as possible. Encased in a pressure-resistant body, you’re able to venture into the darkest depths with perfect clarity. This is thanks to its attached dual light system that can act as your eyes when checking out water conditions in preparation for a dive. It can reach depths of 120 meters and comes with a tether length choice of either 50 or 100 meters. This allows you to keep the drone secure when exploring the unknown. In terms of video quality, it boasts a great 1080p. This gives you the chance to capture all kinds of cool and unusual images from beneath. It even comes with a live video feed so you can check things out in real-time. It’s also super easy to use, which makes it ideal for beginners (which most buyers will be). Simply connect the Poseidon to the WiFi-enabled buoy and film away. This footage can be connected to an iOS or Android compatible app. The application gives you the chance to save, record, and view videos as well as share them with your friends to inspire all kinds of Atlantis-related jealousy. BIKI blends into any ocean or underwater environment in the world with ease. 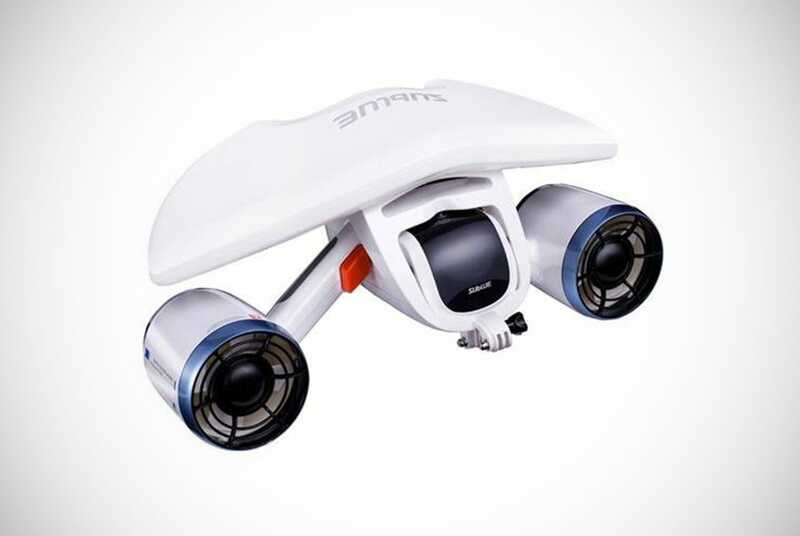 This Japanese underwater drone is elegantly streamlined to make moving through the water simple and straightforward. Though it gives aquatic residents a curious intruder that might result in a Pied Piper situation. With a maximum speed of 0.5 meters a second, it’s not the fastest drone you’ll get your hands on. However, that works to its advantage. It saves on power and avoids disturbing wildlife, giving you awesome shots some couldn’t get. BIKI comes with built-in storage space that can record up to 32GB of high-quality pictures and videos, something that will take much longer than it’s 90 – 120 minute usage time will allow. This means you don’t need to worry about transferring files every time you take it out of the water. Ultimately, this gives you the chance to amass a decent collection of shots. When the battery does run down, it takes only 100 minutes to get it back to full charge. Meaning you can relax and take a break, then get back in the water for some sweet later-afternoon shots. The GPS addition allows it to find its way back home, and sensors that are mounted on the interface prevent it from colliding with dangerous obstacles. For control, you can connect using an app and WiFi, as well as a super cool sonic communication ultrasound when underwater. BIKI is a reality that many a sci-fi fan has dreamt about since they were kids. The YouCan Robot is amazing and truly lives up to the “you can do it” line we hear from those Adam Sandler movies. These underwater drones are an awesome starter drone that comes with all the accessories that you need to get the most out of it. Included in the set is a remote control, battery pack, and charge cable, as well as a tether and carry case. 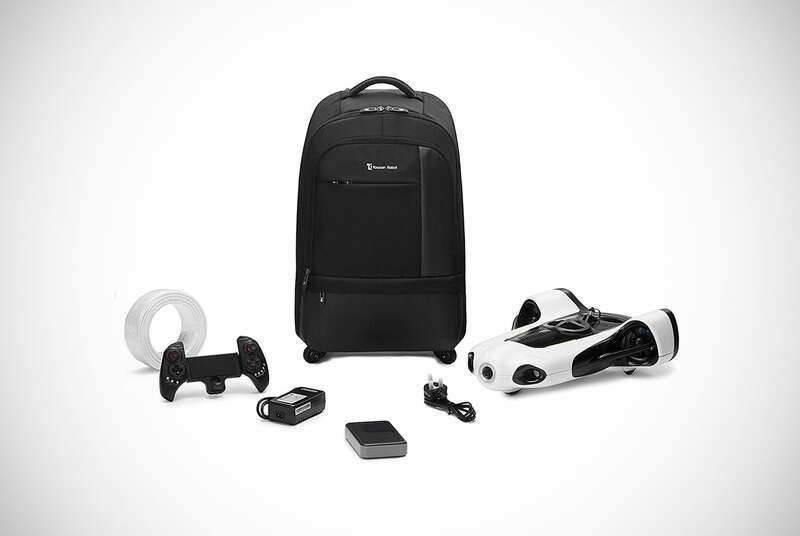 This makes for convenient portability wherever you take your drone. When in operation, you can use the YouCan app to control the speed and intensity of the built-in headlights to see where you’re going. Its 4K camera gives you ultra-high definition images and allows you to see everything as if you were right next to it. All without worrying about getting your hair wet or swallowing salt water. Fish use the restroom in there ya know! Eww! Perhaps its coolest feature is the auto-following capabilities. Acting like a homing missile, you can set it to follow something that will give you a chance at some cool images. Of course, this homing missile does not come any of the explosions and heart-stopping drama. We’re saddened too, but laws and all, ya know? Pro-droner or new to the game, you’re sure to find use in the YouCan Robot that will introduce you to a whole new aspect of what goes on underwater. This entirely autonomous underwater drone gives you the chance to explore the deep in a totally hands-free experience. This makes it perhaps the coolest and most effective drone that can go underwater in the world. If you’re more interested in being the star of the show, this is the drone for you. It’s programmable to follow you throughout your dives and can capture your entire session as deep as 60 meters for around 1 hour. It’s also environmentally friendly, using sonar to avoid colliding with coral reefs. If nothing else, this makes it a hugely attractive product that ensures drone divers won’t get too much of a bad reputation. Heck, it might even be welcomed well beneath the waves. 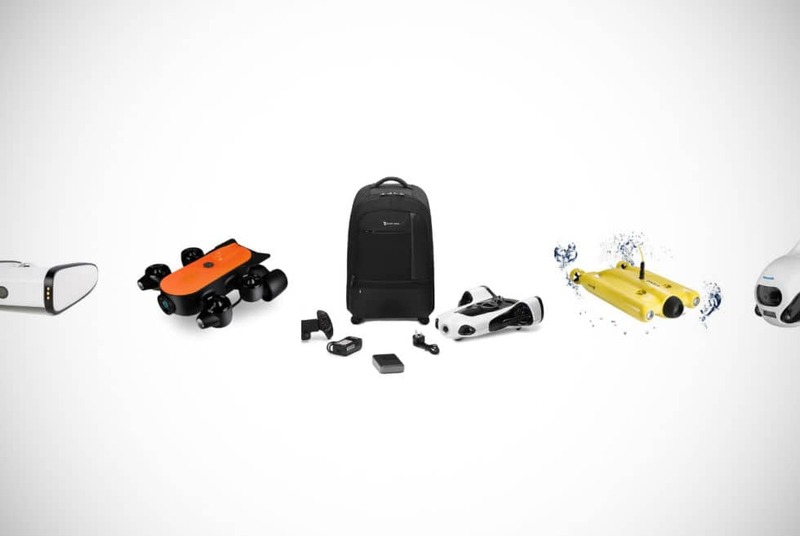 Designed by divers for divers, this is the next step in ocean photography that lovers of the deep have been craving. It’s also controllable from a boat! This drone is just now available for you to get your hands on. As it came out in November, and will likely have the most up-to-date features you’re wanting from underwater drones. The PowerRay Wizard in an underwater fishing drone designed to revolutionize the industry and takes underwater exploration to an entirely new level. It’s equipped with real-time streaming that allows operators to view what’s ahead and act accordingly. It was also designed with a unique fish finder that might also be handy in searching for sunken treasure, but let’s keep that idea between us. It’s heavier than some of the drones on this list, but this means it’s durable. It’s truly able to withstand the occasional knock and bump against rocks without suffering any cosmetic or mechanical damage. Its built-in lights also offer excellent visibility in even the coldest Arctic waters. This ensures that you’ll never feel lost in the dark. With products such as the PowerRay Wizard, underwater drone fishing is something that will transform the way we think about fishing. No longer will fishermen have to worry about accidentally catching the wrong type of animal, or trawl through oceans and end up only pulling out boots. This is the kind of product that will help with underwater conservation as well as save crucial hours of work that could be used for other things. OpenRov made something amazing with this Trident model. It’s jam-packed with features that we’d never expect them to add in. The name itself makes us believe it might be the new King of Underwater Drones. Already, its reputation has spread throughout the tech world and it’s considered one of the best underwater drones available. This is achieved through a massive amount of awesome additions that slightly put it ahead of the rest of the pack. It’s streamlined, stylish, and more futuristic than you could ever imagine. Trident comes with 3 hours of runtime, a maximum depth range of 100 meters, and speeds of 2 meters per second. This speed makes it one of the fastest underwater drones available, while still being incredibly easy to control. This means it can more than keep up with some of the titans of the ocean, and ensure that no shot is missed, all from the comfort of your boat. Witness what lie beneath using the connection control with screen and marvel at the wonders of the open ocean that you never thought you’d see. Fitted with 1080p video capabilities, you’ll be able to catch even the finest details under the water. It’s super portable and incredibly easy to set up, being ready to use as soon as you take it out of the box. These underwater drones will surely give you the chance to explore further than you ever could in a diving suit. If you’re somebody who loves to explore the world with the latest and greatest technology available, then underwater drones should be considered. 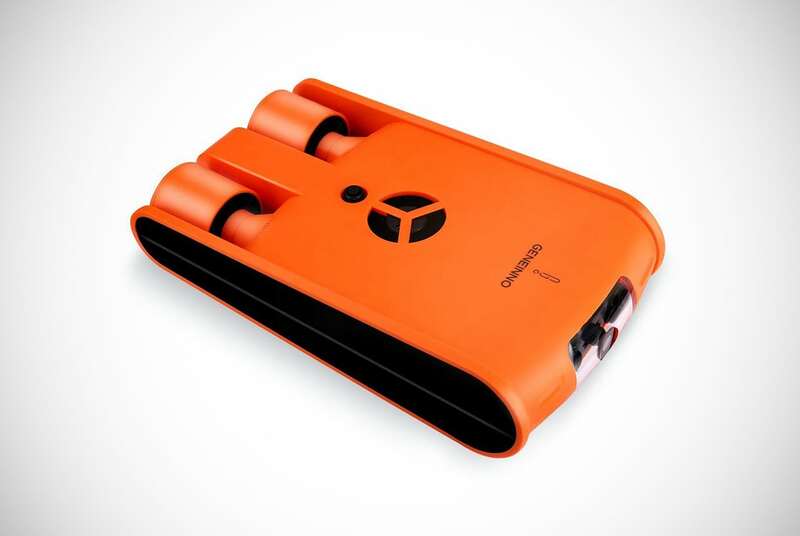 With one, you’ll be able to check out the most amazing visuals that previously were only available to pro-divers. All you explore can be brought right to your hard drive for you to witness whenever you like. Using your drone underwater is fun, simple, and educational, you don’t need to worry about it hurtling towards the ground. No need to worry about colliding with other clumsier drone users. If you want to explore the mysteries of the deep blue sea, this is a must-have product. 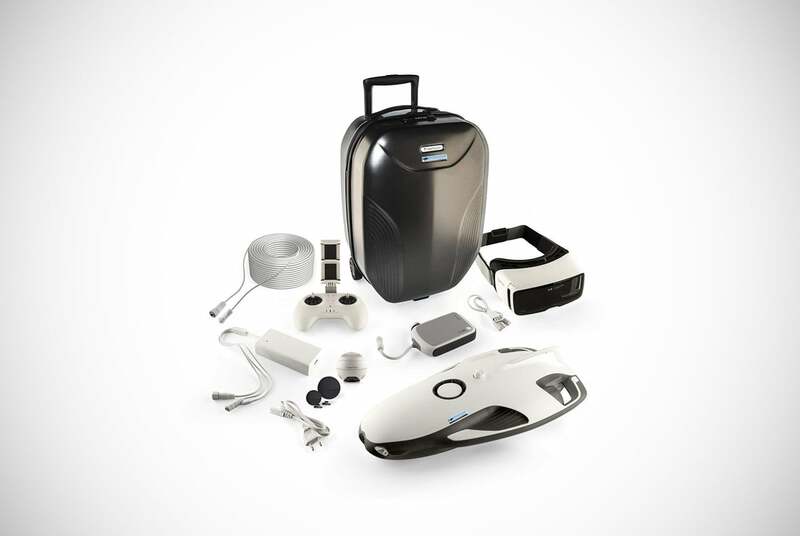 Use it to explore coral reefs off the coast of Australia, and swim alongside sharks in South Africa without the fear of becoming lunch. Overall, you can capture watery memories in the world’s many seas, lakes, rivers, and oceans that will stay with you for the rest of your life. Underwater drones are much more than a simple toy. Its value as an educational tool also cannot be understated. You can be at the forefront of this by exploring previously undiscovered areas all over the world. Be an innovator, and explore to uncover every mystery available. Now hold your nose and take the plunge. 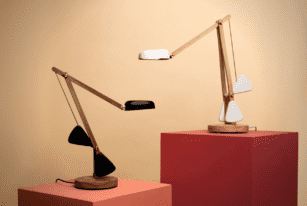 One look at the lamp and you’ll see why people are clamoring for this uber-stylish fixture. Not only does it look beautiful, but it also features a so-called counterbalance system delicately engineered to allow smooth and effortless adjustment to any position. 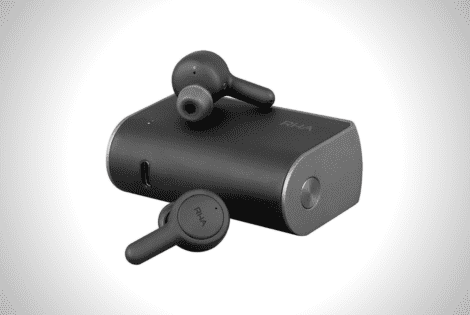 The RHA Audio TrueConnect Wireless Earbuds delivers a frequency range of up to 20,000Hz within a 10m phone-to-earphone distance. It is weather resistant. 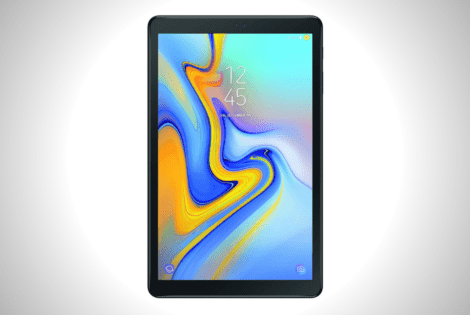 The brand new 2018 Samsung Galaxy Tab A is intended as a mid-range device for games and multimedia consumption with a budget-friendly price. 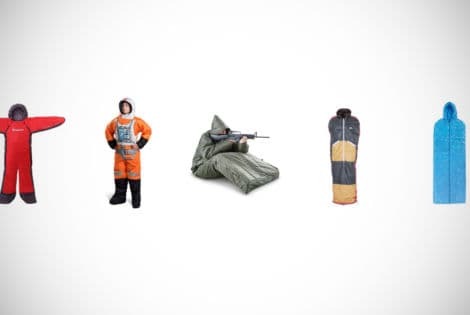 If you love having adventures in the great outdoors, but hate the lack of functionality offered by traditional sleeping bags, check out these wearable sleeping bags!